​Editor's Note: PennDOT is one of the largest agencies in the state of Pennsylvania. And we do a lot: From maintenance and construction on the roads to issuing driver's licenses and providing grants for public transit. On the first Friday of every month, we'll compile frequently asked questions about one topic pertinent to PennDOT. Roadwork can be an inconvenience and frustrating, especially when you're already running late or headed to a fun picnic or vacation. But th​ink about it — either we fix the roads and motorists deal with some work zones, or we do nothing and the roads remain unsafe and in disrepair. It's a classic case of not being able to have your cake and eat it, too. There are some common questions and complaints about how PennDOT handles its construction projects and work zones. Usually, there's a good reason for the way we do things. Keep reading to find out more. Why is construction done while people are coming from or going to work, especially in the summer? Why can't more work be done at night? Why do we use oil and chip instead of repaving roads? Why is a stretch of 5 miles closed to one lane for 100 feet of construction? Why are lanes closed when no one is working? Why is it when I'm stuck in traffic there's one maybe two guys working and five standing around watching? How can I find construction happening around where I live/work? Why are you installing roundabouts? Didn't New Jersey get rid of theirs? When PennDOT performs maintenance on your road and leaves piles of debris in your yard (yes, their right of way) do you have any recourse? Why does PennDOT start so many projects on the same road? Wouldn't it make more sense to finish one section then move to the next? What is the bidding process for projects? Every project is prepared with a Maintenance and Protection of Traffic Plan (MPT) signed by the District Traffic Engineer and the Assistant District Executive for Construction. The MPT gives direction to the contractor about when it can work on the roadway, take out lanes of traffic, detour traffic, etc. This direction is based on analysis of traffic flow and is sensitive to peak traffic volumes. We do our best to accommodate traffic through a work zone but there are instances where we must restrict travel lanes to properly construct a facility. Because warmer temperatures ensure pavement quality, our primary construction season is from April through October. We try to complete projects during this timeframe and not during peak travelling times, but sometimes an extenuating circumstance intervenes. As for nighttime work, some of our contractors are required to work during these hours — especially on expressway projects and other high-speed, high-volume highways — but many have the option to work any schedule they choose based on the MPT. However, working at night on our busy highways is more dangerous for both the workers and drivers. Plus, working at night is more expensive, as the work area is required to be illuminated for reasons of safety and quality control, not to mention overtime for workers. We are responsible stewards of our funds and aim to get the most for every transportation dollar. Some projects appear to take long because of the type of work being completed. Some direct factors are material availability, utility work, subcontractor work, and type of structure involved. Indirect factors may be traffic volume, contractor staffing, and contractor equipment. For example, two-lane bridges can be replaced under a full detour or in multiple stages that allow one lane of traffic to continue using the bridge during construction. During the design process, factors such as the length of proposed detour and number of motorists impacted must be weighed against the shorter construction timeframe a full closure could potentially allow. Seal coating (PDF) (more commonly known as oil and chip or tar and chip) is used to extend the life of lower-volume roads for another three to five years. The cost to reconstruct one of these roads is $910,000 per mile. To resurface, it costs $101,400 per mile. And to seal coat, it's "only" $24,700 per mile. Ideally, roads are seal coated every four to seven years and given a complete structural resurfacing every 15-20 years. PennDOT recently launched its Road Maintenance and Preservation, or Road MaP program (PDF), which will help us use multiple rehabilitation strategies to address nearly 6,900 miles of low-volume roads that are out of cycle. Work zones are always set up with safety (PDF) — for the crew and for motorists — as our primary focus. There are a few reasons why a road could be closed for a longer stretch than might seem to make sense. First, the closure needs to begin at a location that has good sight distance so cars aren't coming around a corner and crashing into stopped traffic. Also, it needs to be back far enough from the workers so that nobody runs through and ends up hitting someone. In cases where the lane restrictions are long term, lanes must close at the start of the project and remain so until its completion. On some large projects, these work zones are extensive, and crews are moving around within the work area or simply working out of view of motorists. On high-speed highways, the work area includes a lengthy transition or a buffer zone to protect the highway workers. Since the cost to set up and maintain these long-term work areas is extremely expensive, it is often far more cost-effective to close off the entire project area and complete the project. Restrictions also must be maintained while concrete cures. Much of the material we use is weather and temperature dependent. 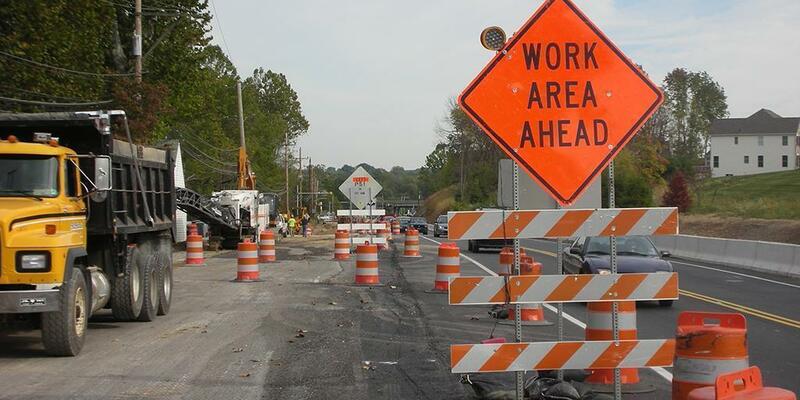 Work zones can be dangerous; there were over 2,000 work zone crashes in Pennsylvania last year. While construction may seem like an inconvenience, it's important to always slow down, pay attention, and obey any signs and flaggers. More work zone safety tips can be found on our website. In many instances, each worker has their own specialty(s) on a project. Each has their assignment and construction work is done sequentially. Also, a person may be a safety inspector whose sole job is to ensure safety. Or a person may be an inspector who does not work for the contractor but is inspecting and validating the work. Others may be trainees or a foreman or management. Also keep in mind that when you're driving through a work zone, you're seeing a snapshot in time from an hours-long operation. The crew may simply be working on a task that requires fewer workers during that brief time. And since roadway workers are out in all conditions, including sweltering heat, it's important for their health and safety to take breaks when needed. The best place to start is 511pa.com, where you can see road conditions, incidents, construction, and more on an interactive map of the state. Zoom in to your location for a detailed view on what's happening on your roads. You can also sign up for alerts from your regional PennDOT office. Roundabouts have been proven to be safer than traditional stop-sign or signal-controlled intersections — with national studies showing that modern roundabouts reduce fatal crashes by up to 90 percent. Modern roundabouts also improve pedestrian safety by allowing people to cross shorter distances with slower-moving one-way traffic. Modern roundabouts in Pennsylvania are NOT the same as New Jersey traffic circles, which operate on a different set of principles. For instance, motorists entering traffic circles tend to have the right of way (not as safe), whereas traffic entering a roundabout must yield to motorists already in the circle (much safer). Traffic circles also tend to be much larger, but are inefficient for handling the increased traffic volumes we face today. Check out our page on roundabouts to learn more and view on video on how to navigate Pennsylvania's roundabouts. Please report potholes by calling 1-800-FIX-ROAD or visiting customercare.penndot.gov. Unfortunately, due to Pennsylvania's severe freeze/thaw cycle, potholes tend to be more prevalent in our state. They can form overnight and are naturally occurring. PennDOT normally tries to remove large piles of debris, especially if they are in a yard, even if it is technically in our right-of-way. If you have a concern about debris left on your property, please call 1-800-FIX-ROAD or visit customercare.penndot.gov. If your vehicle or property has been damaged by work being performed by PennDOT, contact your PennDOT county office. There is a lot of work that needs to be done, so if we waited until one project got done before we started another one, we'd end up too far behind. Also, if we are working in an area, it is economically wise to do additional needed work while we are there and avoid re-mobilizing a work zone at a later time. This ends up being a cost savings to the taxpayer. We do our best to have a corridor approach, but not all roads and bridges in the same general area act in the same manner. PennDOT uses a variety of consultant firms when the demand for services exceeds our ability to provide those services in a timely manner. The Engineering and Construction Management System (ECMS) can give businesses background on the types of work planned and advertised. When a business is interested in a project, it registers as a PennDOT partner and submits a qualifications package. Then, through ECMS, partners can pursue work and be selected for projects. Every two years, PennDOT is required to submit a program of transportation improvements that it recommends to be taken during the next 12 years — this is our Twelve-Year Program. The State Transportation Commission just released its 2017 Transportation Performance Report and is asking for public input through an online survey open until April 19. That input — along with feedback and coordination from local governments and planning commissions — helps to influence how the projects are prioritized. You can view our current project list (PDF) or visit projects.penndot.gov to view an interactive map of our upcoming projects. In addition to the TYP, we have the Transportation Improvement Program, which is the first four years of the TYP and carries additional detail including dedicated funding. If you have specific roadway concerns, please report them by calling 1-800-FIX-ROAD or visiting customercare.penndot.gov. If you have general questions about specific projects occurring in your area, visit the site for your district office, which will have releases on the latest projects. Motorists can check conditions on more than 40,000 roadway miles by visiting www.511PA.com. 511PA, which is free and available 24 hours a day, provides traffic delay warnings, weather forecasts, traffic speed information, and access to more than 770 cameras.